Given the recent history between the No. 7 Boston University men’s hockey team and No. 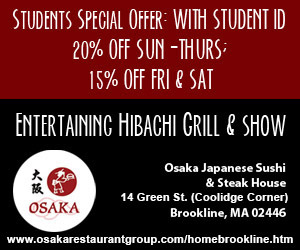 9 Harvard University, Tuesday’s contest should come as no surprise. It was a back-and-forth affair at Agganis Arena on Tuesday, but the Terriers (7-4-1, 2-1-1 Hockey East) scored twice in the third period to secure a 5-3 victory over the Crimson (5-2-1). In their last seven meetings, the two teams averaged a combined 9.1 goals per game, and BU and Harvard again provided a high-scoring battle, with the Terriers coming out on top. 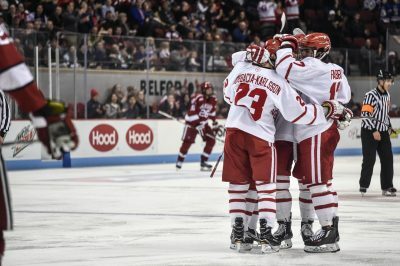 It was the freshman who led the way offensively for BU, as forwards Pat Harper, Kieffer Bellows, Pat Curry and defenseman Dante Fabbro scored for the Terriers. Junior forward Nick Roberto chipped in another goal, while junior goaltender Connor LaCouvee made 29 saves. A big factor in the Terriers earning the win was the penalty kill unit holding a talented Harvard offense to 0-for-3 on the power play. BU has been impressive on the PK all season, and senior defenseman Doyle Somerby credits that to the unit staying calm in big situations. The first period was as wild as they get. Harvard would get on the board first when a slapshot from forward Sean Malone deflected off Fabbro’s skate and past LaCouvee with 9:10 left in the frame. The Terriers would retaliate with 4:30 left in the period when Bellows controlled a loose puck behind the net and jammed it past Harvard goaltender Merrick Madsen for his fourth goal of the year. Unfortunately, Bellows would cost his team later on during BU’s first power play of the game. He tried to leave the puck for a teammate near the blue line, but failed to see Crimson forward Alexander Kerfoot and could only watch as Kerfoot took the puck and beat LaCouvee on a breakaway goal. It was the Terriers’ first shorthanded goal allowed since Oct. 31, 2015. Bellows’ error would be soon forgotten, as Harper scored on a one-timer from point blank range 23 seconds later. Once the second period started, it was more of the same. Fabbro would strike first in the frame, lighting the lamp on a slapshot from the blue line moments into a power play. Given the nature of the game, it would only make sense that Harvard would score soon after on a shot from Kerfoot that LaCouvee probably should have had. Just like that, the score was knotted up yet again. Then in the third, it was Roberto who came up huge. He got control of a loose puck behind the net and his shot deflected off of Madsen’s stick, went between the netminder’s legs and gave Roberto his third goal of the year. Curry would then put the game on ice with a breakaway goal with 1:30 remaining. After his second goal of the year, 19 of BU’s 38 goals have come in the final frame. Quinn credited that stat to assistant strength and conditioning coach Kyle Czech and team consultant Ben Prentiss. Curry echoed his coach’s’ statements, saying the team’s’ performance in third periods shows their resiliency. The Terriers have now won the last three contests with the crosstown rival Crimson, and Somerby pointed out the importance of winning games against rivals.